I parked on the M56 bridge on Brook Furlong Lane before walking along lane out to The Weaver Bend this morning. The hedgerows were alive with Chiffchaff singing and chasing each other. A Cetti’s Warbler was heard hiding away from sight. On the River Weaver were numerous Common Shelduck, Mallard, Tufted Duck and Canada Goose being noted with smaller numbers of Gadwall with Eurasian Teal and 2 Goldeneye lingered a little longer. There were 4 Avocet, 8 Oystercatcher, 1 Common Sandpiper and c30 Black-tailed Godwit on the river bank. 14 Mute Swan made their way towards the Manchester Ship Canal. 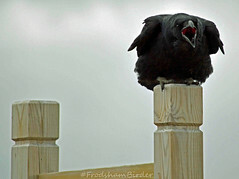 Several Raven were feeding on a sheep carcases and a Common Buzzard sat on a post waiting its turn to gorge on its meat. On to No.6 tank were more Chiffchaff calling from trees alongside the ramp track. A couple of Marsh Harrier were high up over the reed bed. Several Eurasian Teal, 20 Mallard, 40 Northern Shoveler, 64 Common Shelduck, 40 Tufted Duck and 10 Gadwall were all present on the water and a flock of c80 Black-tailed Godwit passed overhead on their way to the Mersey estuary. c100 Eurasian Curlew were feeding on No.3 tank’s mitigation pools and more Eurasian Teal, Northern Shoveler, Mallard and Lapwing. Out on the Frodsham Score salt marsh were several hundred Pink-footed Goose feeding close in to the edge of the marsh but took to the air and moved out towards the river. The Ince marsh fields had 23 Mute Swan in their usual place and another herd could be seen out by the river but to far to identify. Walking back along Lordship Lane a flock of Linnet feed in the stubble field and were ambushed by a Sparrowhawk. Also noted 6 Reed Bunting were on territory along the lane. Observer: Paul Ralston (images) and additional counts by WSM.